You can target 2 “Metalfoes” cards in your Graveyard and 1 card on the field; shuffle the targets from your Graveyard into the Deck, and if you do, return the target on the field to the hand. You can only use this effect of “Metalfoes Mithrilium” once per turn. If this card is sent from the field to the Graveyard: You can Special Summon 1 “Metalfoes” Pendulum Monster from your Graveyard or face-up from your Extra Deck. Happy Friday! Metalfoes Mithrilium is a Level 6 Fire Psychic-type Fusion Monster with 2600 Atk and 1000 Def. It can really only be summoned in its own deck with a Metalfoes monster and a Pendulum Monster. For your trouble you get a decent attacker and the ability to bounce a targeted card on the field to the hand at the cost of 2 targeted Metalphoes grave monsters being shuffled back into the deck. All three cards should have been shuffled into the deck, but that’s just me. Then if Metalfoes Mithrilium is sent to the grave from the field you get to Special Summon a Metalfoes Pendulum Monster from your grave or Extra Deck (face-up). Strong, decent effect, and replaces itself, all good traits. No versatility in other decks, but the second effect isn’t once per turn which is nice. Now we just wait for their Link Monster. We end the week off with a card representing the Metalfoes archetype, and their best Fusion Monster, Metalfoes Mithrilium. Mithrilium is Level 6 Fire Psychic Fusion with 2600 ATK and 1000 DEF. ATK is good on a Level 6, DEF is meh. Type and attribute are whatever to be honest, even though I love both Psychics and Fires. Mithrilium only needs a Metalfoes and a Pendulum monster to Fusion Summon. Easy in Metalfoes as all the main deck monsters are Pendulums. As a hard once per turn, you can shuffle two Metalfoes cards in the GY to the deck to bounce a card on the field back to the hand. 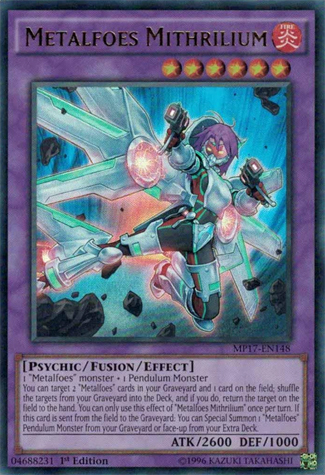 Good way for removal, Metalfoes cards can fill the GY easily with the Spells/Traps, though the original Metalfoes Fusion can put itself back, and if you use Pendulum Monsters in the hand for a Fusion Summon. This effect should be live very often. Also, when Mithrilum goes to the GY from the field, you can summon a Metalfoes Pendulum Monster from the Extra Deck face-up or from the GY. Sadly, you cannot get a Fusion back, but that is what it is. This is the best card for Metalfoes in the Extra Deck excluding the Link Monster they get in Extreme Force, if there is one Fusion you will play more of in Metalfoes than others, it is this one. 2 is recommended because it is a Fusion and one copy can recycle the other. Next articleReader’s Choice: What Kind of Articles Are You Interested In?